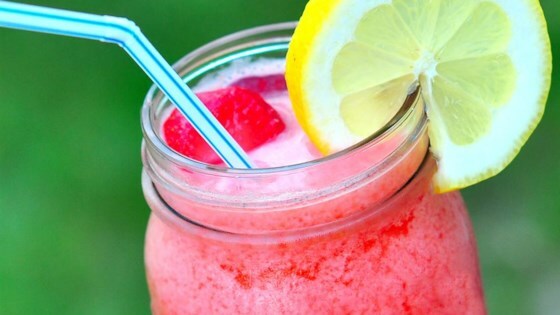 "Strawberries, lemonade and ice are blended into a refreshing slush. A simple (non-alcoholic) fruity treat, fantastic in any season!" This was good but the lemonade overwhelms the strawberry taste. Next time I will add more strawberries but it was still very good. I tried this recipe for our Memorial Day Cookout - I had made 2 gallons and ran out within the first hour! Everybody loved it! Easy to make and serve. I usually make this yummy recipe with a strong lemonade mix, ice and fresh strawberries. My husband likes the tiny ice chunks. Did not like. It was very sour. Left a bad aftertaste. Very lemony! If that's what you're looking for don't change a thing! If you want less of a lemon taste add more water. I also added rasberries to mine! This lemonade was very tart so I added about 1 Tbs of pineapple juice to balance out the flavor... Can't wait to make it again soon!!! Overall, this was a great summer drink! Yum! Everyone loved the tart flavor. Very refreshing!